4 inch custom circle shape magnets 25 mil is a smart marketing choice by all means. It offers a larger imprint area for marketers to work upon and they can expect it to stay in service for long time than regular 20 MIL magnets. 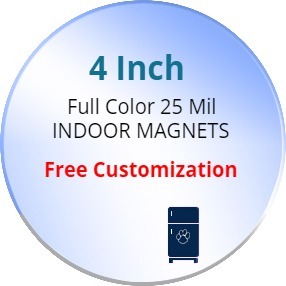 Many small budget marketers find this magnet budget friendly because we offer attractive price benefits on bulk orders. This magnet can be used for making any special business announcement or for brand familiarizing. Request a quote to know discounts on bulk orders of this customized 4 inch diameter circle shaped 25 MIL full color magnets. Product Size: 4 in. x 4 in.